Go to Company Settings > Toolbox > Etsy General Settings. Copy and paste your Etsy Shop Name into the Shop Name field. Go to Action Menu > choose Fetch Token > Go. Press Click here to login to Etsy.com. Click Confirm Account. After you save, it imports the API Key and API Secret Key. 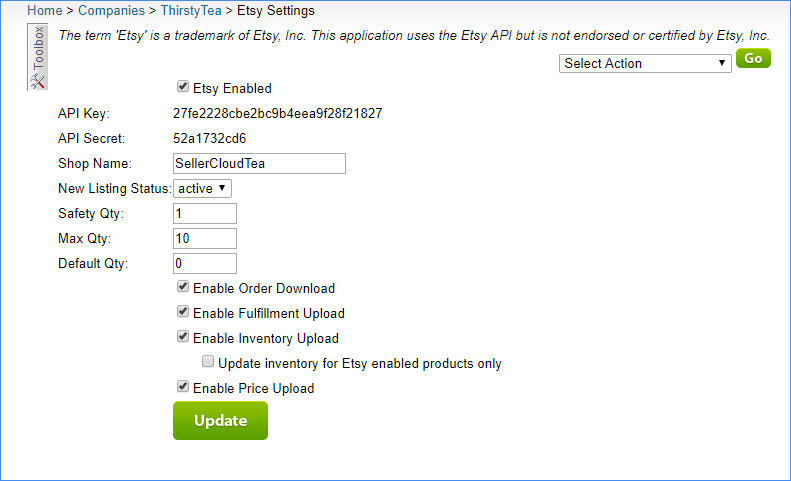 Enable Order Download and Enable Fulfillment Upload - Select these when ready to ship Etsy orders. Enable Inventory Upload - Select this when your inventory is accurate for listings. You may want to set a default safety quantity. Enable Price Upload - Select this to automatically update product pricing. Leave unchecked if you only want to send price when posting items or when manually updating it. If you are using Etsy shop sections to organize your items and want these sections available in each product's Etsy Properties' Shop Section dropdown field, click Action Menu > Download Shop Sections > Go.